This blog site focuses on cards and projects utilizing materials and tools from various scrapbooking and paper craft companies. If you are interested in cards and projects made with rubber stamps from various companies, please check out my other blog site "Stampin' Inspirations". Blog Roll - Check It Out!! Looks like Feedbitz had a few problems accepting subscriptions yesterday. It appears Feedbitz is now working. If you attempted to subscribe yesterday and could not, just letting you know, that if you want to subscribe to my blog you are now able to. If you want to email me, click on the following email: lbmcd66@hotmail.com. Please email me only in regards to the contents of this blog site. Thank you. My name is Maria and I'm a Stampin Up Demonstrator! Contact me if you are interested in Stampin Up products, promotions, or joining the Stampin Up family! 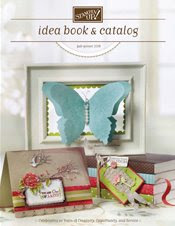 I love paper crafting, creating handmade cards, and scrapbooking projects. I hope you'll take the time to read the blogs and that you'll find it useful. Hopefully, by reading my blogs, you will also feel inspired like I am with all that is paper crafting. I'm on Vacation - Virginia and Washington D.C.